Sea Bass and Crab in Kingdom Hearts 3 are cooking ingredients. You need Kingdom Hearts 3 ingredients, like Crab and Sea Bass, you make dishes in Remy’s Bistro in Twilight Town. The trouble is that finding KH3 Crabs and Sea Bass can be a little tricky. Each of them appears in only one map, and even then, you really have to go looking. It’s a headache you really don’t need. So, here’s our Kingdom Hearts 3 Sea Bass & Crab Ingredients – Where to Find guide to show you the exact locations of crab and sea bass for your convenience. Where to Find Sea Bass & Crabs for Cooking Recipes in Kingdom Hearts 3? To find the Sea Bass cooking ingredient in Kingdom Hearts 3, you’ll have to go to the Kingdom of Corona. As far as we can tell, this is the only place where the Sea Bass spawns. Where exactly? At the sea shore, near the bridge that leads into the castle. You can start from the Forest: Wildflower Clearing fast travel point. Go east across the clearing, and blast through the narrow path that curves to the north. This will bring you right onto the Shore area. Go into the water, and look for small, circular ripples. The game will lock onto them when you get close enough. Those ripples are actually Sea Bass locations. So, all you have to do is interact with them to collect them. It’s simple; the only potential catch is that you might miss the ripples in the water. 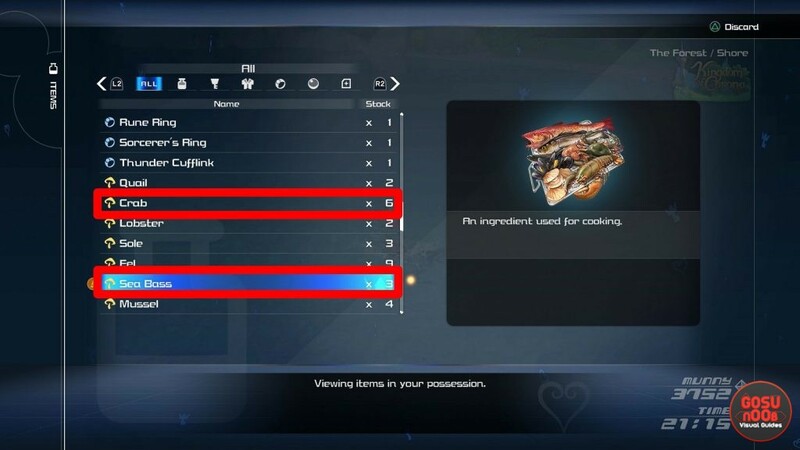 KH3 Crab Recipe Ingredient – How to Find & Get? As for the Crabs that you need as a cooking ingredient in Kingdom Hearts 3, you’ll have to travel to The Caribbean. And then, you’ll have to go diving. Now, the potential problem here is that they’re called Crabs, but in fact are quite clearly golden lobsters. Oh well. Anyway, one Crab location is near the High Seas Huddled Isles fast travel point. Dive into the small lake that leads into an underwater cavern. After you swim through the narrow passage, and enter a larger cavern, look for the Crab on a wooden crate on the cave floor. You can also swim across the rock in front, and find another Crab on the other side. That about does it for the Sea Bass and Crab ingredients in Kingdom Hearts 3. If you need further help with cooking and ingredients, you can check out our following guides: Cooking Recipes & Ingredients List, Miller Mushroom Location – Cooking Ingredient, and Flantastic Seven Locations & Rewards.